Nature's Sunshine Products produces the purest, most potent natural health products available anywhere. Watch this video and discover real quality! Learn about TLC�not just Tender Loving Care but Thin Layer Chromatography used to identify the right herb and the right part of the plant. Does your supplement company do that? An independent, Nationally recognized, third party company recognizes the quality Nature's Sunshine holds as standard: NSF International, a non-profit, non-governmental organization and world leader in standards development and product certification, presented Nature�s Sunshine with the NSF Good Manufacturing Certification. "I've heard Nature's Sunshine's xylitol is made from corn. What if I have a corn allergy, or corn isn't on my specific dietary suggestions"? Thank you for your inquiry.<?xml:namespace prefix = o ns = "urn:schemas-microsoft-com:office:office" />Xylitol comes from the fibrous parts of the corn plant (husks, cobs, stalk). The corn kernel is not used as a source of xylitol. Because xylitol is a purified ingredient, it should not pose a concern to individuals who are allergic to corn proteins. No corn proteins are found in xylitol.Best wishes,Health Sciences & Educational Services DepartmentNature�s Sunshine Products, Inc. For further Health Sciences questions email us at hs@natr.com. For general questions please call Customer Service at (800) 223-8225 or email questions@natr.com. Unless otherwise indicated, all NSP products mentioned are referring to products sold within the United States. If you have questions regarding products sold in other markets, please contact a representative from your specific market or visit your country�s NSP website.Federal and state laws and regulations preclude Nature�s Sunshine Products from making specific medicinal or drug claims for its nutritional supplements. However, many products provide essential substances that affect bodily functions that may be influenced by poor dietary practices. Nature�s Sunshine nutritional supplements are designed to provide nutritional support of the body as it works to maintain a healthy condition.These statements have not been evaluated by the Food and Drug Administration. These products are not intended to diagnose, treat, cure or prevent any disease. For counsel on injuries or disease, Nature�s Sunshine recommends that you see a health professional who can help you make responsible decisions concerning your specific health concerns. 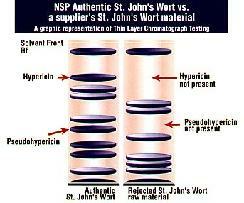 Look at this comparison between NSP's St. John's Wort and rejected raw material. Hypericin and Pseudohypericin— two key active factors— are not even present in the opposing sample of raw material. Various important tests are performed throughout the production process. Each sample is tested on the cellular level by microscopic inspection and is compared to previous samples. Numerous physical tests are conducted to protect against contamination from dirt, sand and other inorganic materials. Sophisticated liquid and gas chromatographs are also performed to insure proper active constituents are present and pesticides are not. 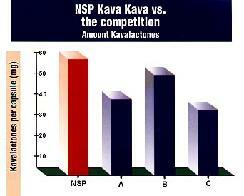 NSP conducts numerous tests to measure the effectiveness of their powerful formulas. 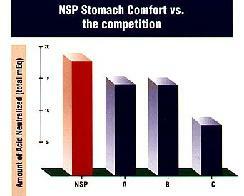 Look at this comparison of how NSP's Stomach Comfort neutralizes up to 50% more acid than other brands. These kinds of tests reveal the essence of potency while enabling you to get the most value for your money. Following are several tests that are conducted by NSP to assure quality, potency, purity and safety of all Nature's Sunshine products. At least two types of tests are regularly performed: Swabbing and Bactometer. These tests ensure that the production work areas are free from bacterial contamination. The bactometer detects the growth of organisms by measuring changes in electronic signals passed through testing modules containing suspect bacteria. The bactometer is used to test for mold and yeast, among other things. An increase in conductivity indicates growth of organisms. The changes are carefully measured to count organisms present. When levels of bacteria outside of NSP's stringent specifications are detected, the entire lot or raw material is rejected and returned to the vendor. Nature's Sunshine is the first company in the industry to utilize this powerful technology. E. coli tests are performed with count plates that contain an indicator that turns the bacteria blue, allowing for effective visual identification and rejection of the lot of raw material. 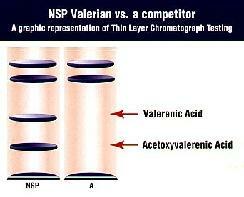 NSP utilizes the 1-2 test to perform detection of Salmonella long before standard culture methods would. Organoleptic testing is usually the first step in quality testing. This involves testing taste, odor, color and appearance of the raw material. Plant species, part, and purity tests are performed with Microscopy testing. This involves preparation of the raw material on a slide for visual inspection and identification on the cellular level. Thin layer chromatography (TLC) is used in combination with Infared Spectroscopy (FTIR) not only to positively identify individual parts of herbs, but to measure the actual amount of constituents contained within. FTIR passes a beam of infared light through a sample. This process provides the "absorption spectrum" of the item being tested. This test is critical because it is able to accurately measure the presence (or absence) of key constituents and the potency thereof. This test makes it possible for NSP to detect "over-harvested" raw materials (such as goldenseal) that may be low or completely missing key components. NSP then rejects these impotent raw materials. High Performance Liquid Chromatography (HPLC) is an extremely sensitive test used, for instance, to measure parthenolide content in feverfew and ephedra content in Chinese ephedra. This test can actually measure specified constituents to the parts per million. The ash test involves burning a sample of an herb in a special microwave furnace for one hour at 700 degrees Centigrade. This process leaves only inorganic materials and provides for subsequent measurements of mineral content and contaminants. Acid Insoluble testing (AIA) treats the remains of the acid test in hydrochloric acid and repeats the burn test. This test reveals materials that contain inordinate amounts of metal particles. Materials from eastern Europe have been occasionally found to be contaminated with radiation resulting from the Chernobyl nuclear disaster. Gamma testing allows NSP to reject lots of raw materials containing radiation contamination. Gas Chromatography/Mass Spectrometry separates a material into its component parts and then analyzes each part. This powerful technology provides NSP with the ability to ensure that raw materials are free from foreign contaminants such as pesticides. Inductively Coupled Plasma Spectrometer (ICP) sprays a solution containing the material to be tested into a controlled 8,727 degrees Centigrade flame. The resulting light emissions are charted to reveal mineral content. This test provides the ability to detect mineral content measurements and allows for rejection of materials that contain unwanted elements such as arsenic, lead, cadmium and mercury. This test is also used to ensure that several products, including Super Supplemental and Mega-Chel, contain the correct amount of minerals. It's not enough that NSP obtains raw materials from the most reputable suppliers in the world. NSP also maintains the highest quality standards for the potency and purity of their products. With over 150 standard tests and procedures in practice, you can feel secure in the knowledge that NSP consistently produces supplements that are as pure and potent as they can possibly be.